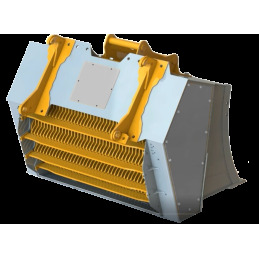 Brown line screening buckets have been designed for screening, mixing and crushing applications. Good material quality and new generation design allow big volume of bucket which results in amazing productivity. Many axel options are available according to application and changing of axels is very easy. Design of axels allows material to move back and forth effectively and thus increase productivity. Smooth material flow is increasing output. The most typical applications of screening buckets is top soil screening, pipe line works, crushing of different material, compost mixing, screening of peat etc. All screening bucket models are available for excavators and wheel loaders. The range consists of 8 models and many axel options for 5 - 40 t excavators and 3-30 t wheel loaders. Screening axels are designed for top soil screening. Also for peat or similar. Very good for pipe line or trench screening. Contaminated material, sludge handling etc. Mixing axels are designed for mixing of biowaste or similar. Also for peat and other sticky material, crushing of bricks, glass ext. and mixing of compost etc. Crushing axels are designed for screening and crushing different material. Aggressive shape ensures good productivity.